I've fallen behind on my posts again! Between working on an upcoming teacher workshop, ID'ing moths, weekend hikes and regular housework, I haven't had time to post. 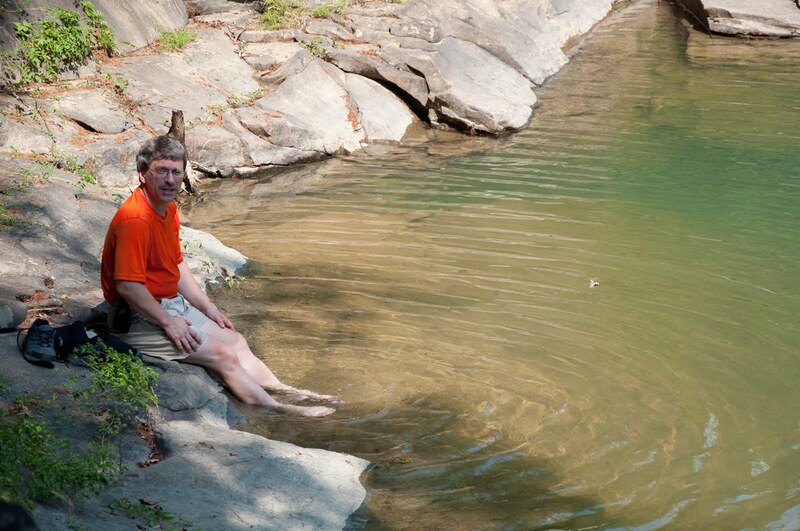 A couple of weeks ago Kenny and I went up to the Obed to check out a trail we had not hiked before. We also wanted to try out our new Garmin 60 CSx GPS. We hiked on the Cumberland Trail about 2.5 miles out to Alley Ford and down to the river. It was a very hot and humid day, even "wicking" mater ial in our clothes didn't help much! We saw some pretty fungi, one pink and one blue! 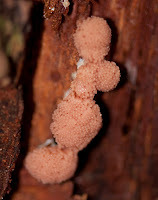 The pink ones were growing on a decayed tree stump and looked like little pompoms. 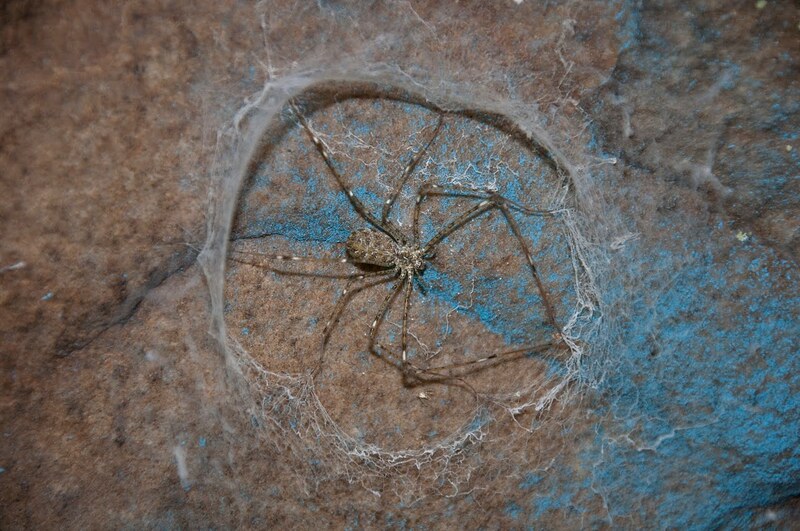 As you can see, the blue one was growing next to a Lampshade Spider, she had pretty "bedroom walls"! At first I thought it was blue paint, but the trail blazes were a different color and this was under a rock overhang. 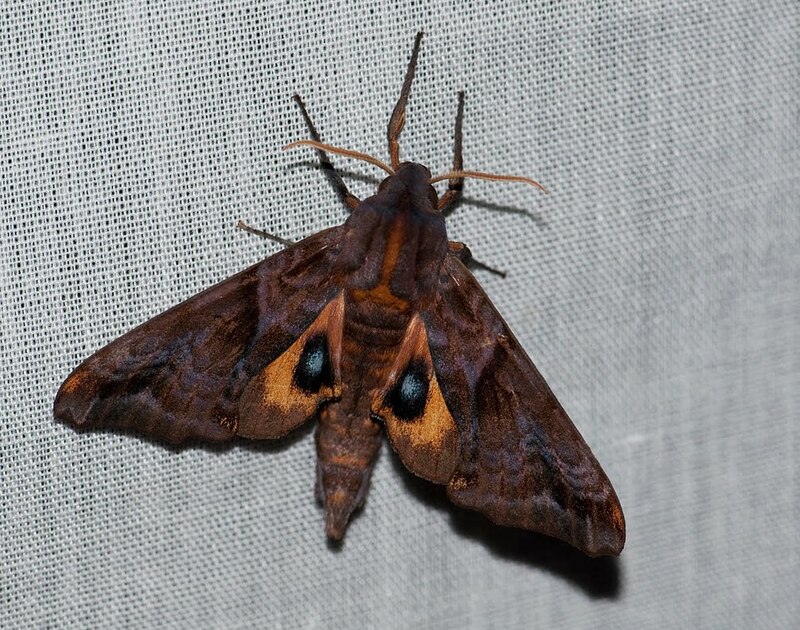 I'm up to 180 moths on my list now! Most of those have been seen at the sheet on my car por t. They seem to go in spells of good nights and slow nights. I was very excited to see a Wood Nymph Moth, left, (it actually looks a lot like a bird dropping!) one night. It took a while to get it calmed down enough to get some good photos. 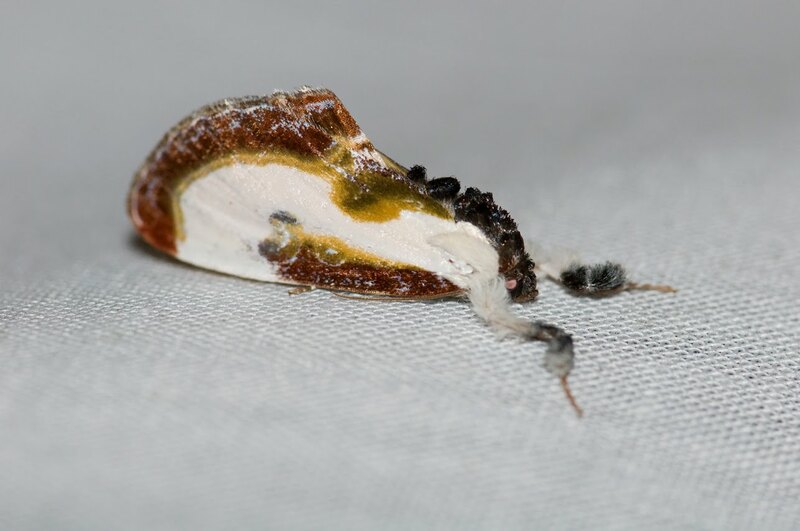 This moth has the oddest looking front legs! Another night I saw something flying around erratically that looked like a s mall bat. 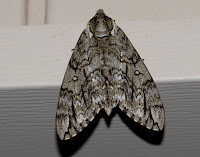 It was a huge, gray Waved Sphinx Moth that finally decided to perch on the carport support beam. The Small-eyed Sphinx Moth was another interesting visitor, it was a little more cooperative! 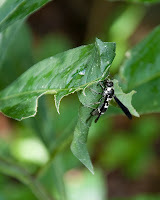 I was glad it opene d its wings to show its "false eyes". Last Friday I taught a class at Tremont, the field school in the Smokies. After the hike, I walked around the campus to see what was blooming or out hunting. I spotted this wasp crawling on a rolled leaf, she was trying her best to get to the caterpillar that was living inside the tube! I don't think she was successful though! Last Sunday we went hiking at Piney River State Natural Area in Spring City with our frien ds, Terri and Rod. It was their first hike there. Despite being another 90+ degree day, we were in the shade most of the day, so it wasn't too bad. 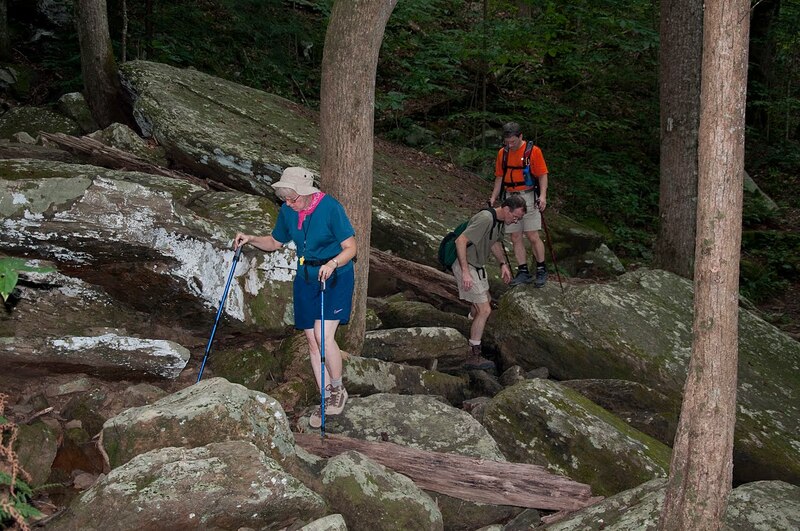 Fortunately, it was dry this time, so we didn't have any trouble getting across the boulders at McDonald Branch. When we got to our destination, the 100' bridge, we ate lunch and th en cooled our feet in the river. Whoever is in charge of trail maintenance at that area needs to pack in some chainsa ws and clear some dead trees. 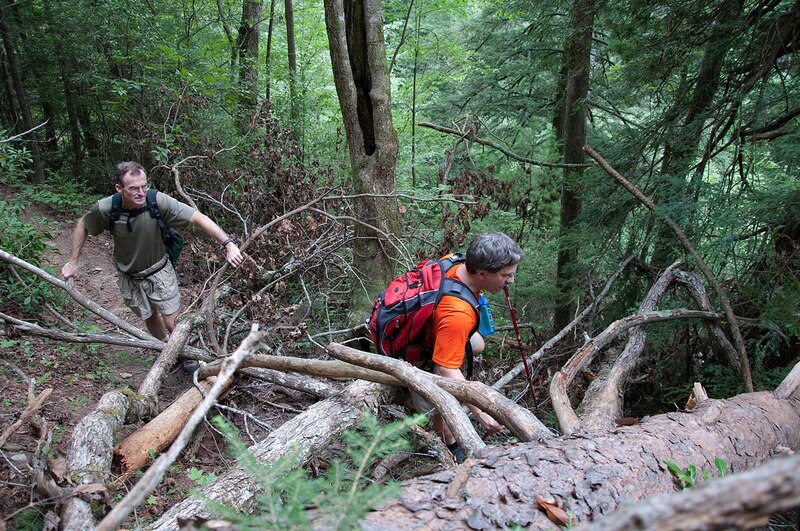 There are several fallen trees across the trail that make the hike a bit more challenging!